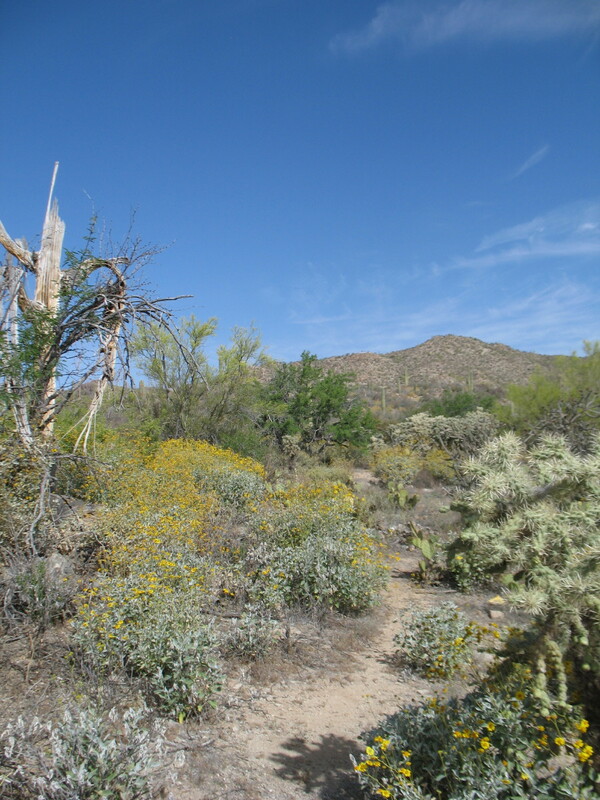 First leg of the trail is accomplished up to the big saguaro. The trail is deep in growth, and so fluid with nature, at this point, that I lose it easily, as it meanders. There is a lot of biodiversity along the way and some Indian pottery chards; it’s a great nature trail. I’m away from places where it might be discovered. I have left only subtle markings to keep it less evident. With use, some of that will change. I’m attempting to keep the footpath away from vegetation and rocks that might hide rattlesnakes in their shade, when they come out, so I will have no surprises. I need to create this thing before the snakes come out of hibernation, which with this warm weather, may be sooner. So far, I don’t believe that I have had to kill a single plant, just trim and explain to them. One in particular has twice voiced disapproval on my wrist which has two streaks of blood presently. In this desert, everything has pricks and scratches waiting to defend its space. I’m probably one third of the way done. The next leg will require more survey, as it leads through rocks on a ridge and out of the flood plain. I have used some old rusty things like a barrel ring, or a carpet scrap that are not native, and put some dead cholla trunks in unnatural positions as cairns. In the hills it will be more difficult, or I may have to import these objects. There are many places where the route will travel across rocks. I’ll need clues, to remember the way. It is not straight at all. It is a series of openings to avoid sharp vegetation. It is also placed to keep me covered. I get the feeling of being totally away from man, naturally. It is interesting making and planning a stealth trail with a free range naturist’s stealth craft and wisdom. It is a non-trail trail. If it rained tonight, I would lose the track. There are trails made by animal tracks out here. Since they already exist, I must use them to link together my unseen stealth trail.